Jan. 2, 2019 | 11 a.m. Volunteers are an integral part of helping the Wisconsin Department of Natural Resources keep track of the state's gray wolf population, which has grown in size and range over the past several decades. Data from the agency showed that during the 2017-18 winter, staff and citizen scientists tracked wolves and other predators more than 16,000 miles across the state with the goal of identifying the total number of these animals. Observations gathered in the field are one of multiple methods the DNR employs to obtain an accurate wolf count. These efforts include recording howls during the summer and counting paw tracks during the winter, investigating depredation reports of livestock, and determining the number of dead wolves. Scott Walter, a large carnivore specialist with the DNR, explained how this practice works and discussed the status of wolves in the state in a Nov. 14, 2018 interview on Wisconsin Public Radio's The Larry Meiller Show. "As wolves expanded across the northern and central part of the state, the DNR couldn't do those things alone, so we reached out and asked for help from the public," said Walter, who oversees the coordination of wolf, bear and cougar management within Wisconsin. He noted that the program usually has more than 100 volunteers helping to track wolves each winter. Hunted to the point of extinction in the 1800s and early-to-mid-1900s across the state and the contiguous United States, the gray wolf (Canis lupus) eventually was isolated to northeastern Minnesota. "That led to a belief that wolves must be a species of wilderness areas, because that's the only place they're found," he explained. "But what they've taught us since is … as long as there is food to eat, as long as, in Wisconsin's case, there's deer on the landscape, they'll be happy just about anywhere." With a comeback aided by protection from the Endangered Species Act of 1973, wolves reclaimed habitat in Wisconsin. By the 2010s, the species was established across the entire northern third of Wisconsin as well as in the Central Sand Plains region, with numbers hovering around 900 by 2017. Areas in northern Wisconsin and pockets in southwestern and eastern Wisconsin were surveyed by Wisconsin Department of Natural Resources staff and citizen scientists who volunteer to help track animals such as wolves. Between 2017 and 2018, 16,133 miles were tracked. Wolves generally roam across an average area of 40 to 50 square miles, said Walter. That means people living in a specific wolf territory probably won’t see wolves apart from the pack that claim that area. "That territorial behavior allows wolves to sort of self-determine their own densities," he said, noting that some wolves are beginning to spread out into agricultural landscapes. Wolves first gained protection in 1974, a year after the Endangered Species Act was signed into law. They were listed as an endangered species in 1978 by the U.S. Fish and Wildlife Service throughout the lower 48 states, with the exception of Minnesota. By July 2000, the Fish and Wildlife Service, which monitors the species in the Midwest, proposed reclassifying wolves as threatened, a designation that offers fewer protections. A reclassification was implemented in 2003. Wisconsin state laws related to managing wolf numbers have oscillated between protection measures and allowing hunting, with a season opening in 2012 and closing again two years later. When wolves aren’t under federally protected status, state law requires that a hunting season is held, said the DNR's Scott Walter. 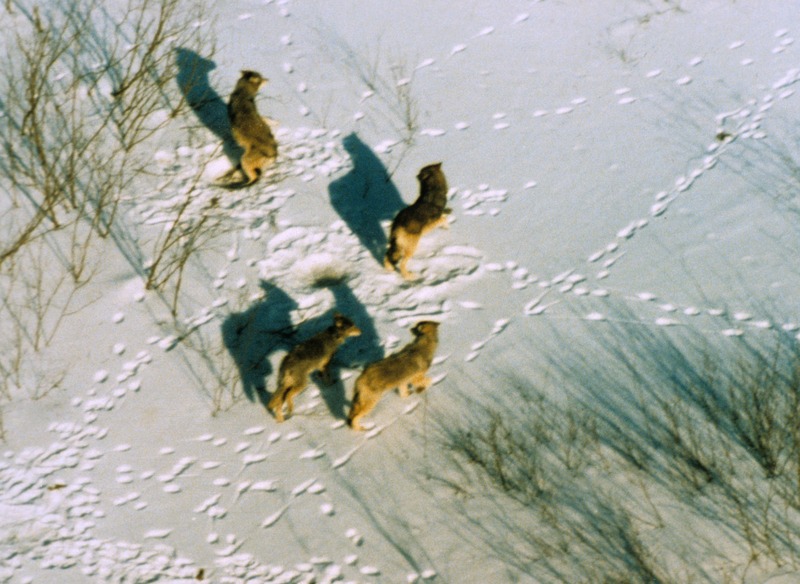 The contentious debate over wolf protections is meaningful to the DNR's tracking work, Walter explained, because it determines the extent to which the agency can manage wolf numbers. Under federal protections, the state is prohibited from culling wolves unless there is a threat to human health and safety. At the national level, the U.S. House of Representatives passed the "Manage Our Wolves Act" in November 2018 to remove gray wolves from the federal endangered species list. But the legislation must be passed by the U.S. Senate and signed into law by the president to alter the protected status of the species. At the state level, Wisconsin has a wolf management plan, first published in 1999 and modified in 2006. The plan originally called for a population goal of 350 wolves, which has since almost tripled. "As we get closer to a delisting decision, we're certainly going to work with the public … to revisit that and decide whether or not 350 should continue or some other population goal," Walter said. Location matters, too, because wolves and people might come into more conflict in southern Wisconsin, where populations are higher and there are greater numbers of livestock and roads. "Wolves may be able to persist, but the impacts of encounters with high human densities may not be good for us or wolves," he said.